You are at:Home»iPhone»Battery»How Do I Turn On Battery Percentage On My iPhone? Nothing spoils an afternoon of selfie snapping and Facebook browsing like a dead battery on your iPhone. Shouldn’t it be easy to tell how much battery is left on your iPhone? Fortunately, it is! 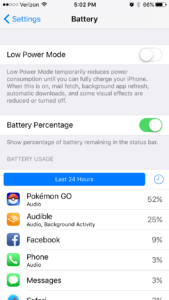 In this article, I’ll tell you how to turn on your iPhone’s battery percentage so that when you look at the battery icon, you’ll see a number telling you how much battery power you have left. Tap the switch next to Battery Percentage to turn it on. Your battery indicator will now display the percentage of battery life remaining on your iPhone next to the battery icon in the upper right-hand corner of the screen. Now that you know how to turn on your battery percentage on your iPhone, you’ll never have to guess how much battery percentage is left again! So go ahead: Snap a few more pictures of your family or your cat, or re-post your favorite recipe on Pinterest. If you have any other questions about how to use battery percentage on your iPhone, let us know in the comments section below. Previous ArticleMy iPhone 7 Plus Is Hissing! The Real Reason Why. Next Article How Do I Change The Name Of My iPhone?